The importance of being able to effectively manage compliance within a large organization isn’t lost on the vast majority of the ITSM industry. But is achieving this easier said than done? Our recent implementations with two large governmental institutions suggest that, with the right planning and processes, it might not be as difficult as you think. 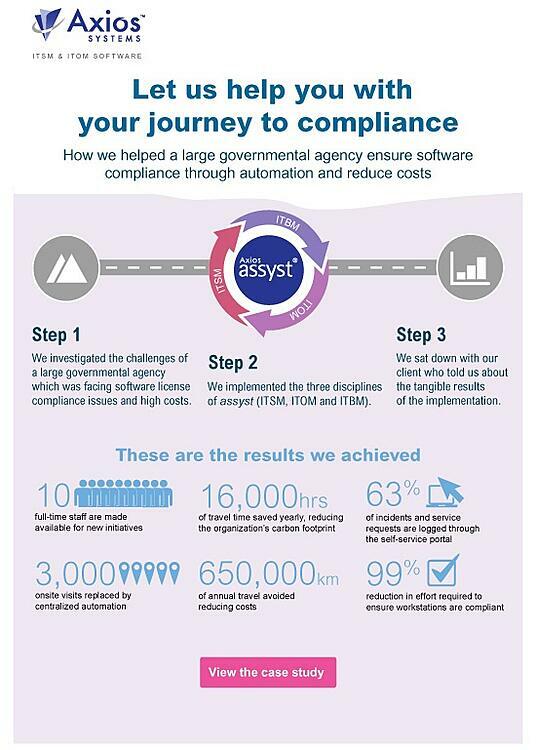 The common denominator in each of these success stories is assyst: maintaining maximum visibility over patches, licenses and compliance opens the door for reduced overhead costs and increased productivity. Our comprehensive infographic details the sort of business benefits you can achieve with an effective IT strategy. What benefits can you achieve with assyst? The first step to becoming more efficient and increasing profitability in your department is to reduce unnecessary expenditure. Activities such as travel, onsite visits, and man-hours carrying out basic tasks can all be replaced via process automation. Through an integrated assyst solution, your IT team’s sites can be automatically monitored and controlled from a centralized location. This allows employees to: a) focus on more labor-intensive tasks, b) reduce the amount of money spent on travel and c) limit the number of onsite visits which impact finances and timescales. One of our large governmental clients managed to replace 3,000 onsite visits and nearly 650,000km of travel by adopting automation from one central location. The knock-on effect was that the organization became more efficient and saw an increase in staff productivity, as their time was better spent on more value-adding tasks. So what makes these gains achievable? Ensuring you have a system that is both scalable and easy to configure is a key stepping-stone when adopting an IT strategy. Our assyst solution runs itself – applying an intelligent process to verify and ensure compliance on a daily basis – which means the average day for a field service team now looks very different than before. Through automating asset management, your team spends less time traveling between different sites and more time applying their technical skills to support continuous improvement and new IT initiatives. But the key benefit of assyst is its flexibility: using this method, your organization can empower end users with access to a broader spectrum of technology without compromising compliance. Automation then frees up these users to attend to more imminent tasks, meaning your organization reduces costs – both operational and financial.